There are few things in the world that I find more pleasant than snuggling up with the dog on the couch while delicious food creations are conjured in the kitchen, filling the house with wonderful scents. 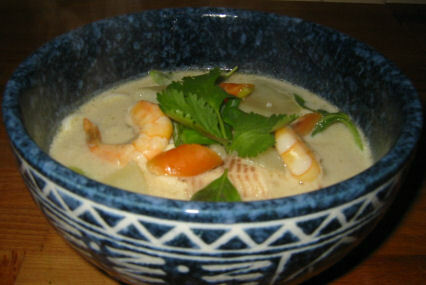 I had the pleasure of that experience the other night while Jef created this Thai curry soup. He used coconut oil for this one, so the distinct but delicate scent of coconut was already wafting through the air from the moment the cooking began. This was a perfect soup for a cold night, with the warmth of soup and warmth of spicy green curry both working to take away the winter chill. Mince garlic, ginger, and the whites of the green onion. Saute in oil until fragrant. Add green curry paste and saute for 1 minute. Add coconut cream and 4 times as much water. Add potatoes and carrots and bring to a boil. Cook until potatoes are fork-tender, then add the seafood and bok choi and reduce to a simmer. Serve over cooked rice noodles or steamed rice. Garnish with scallion tops and chopped cilantro.